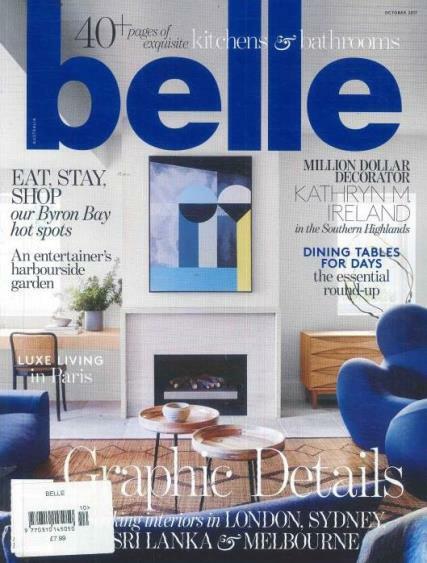 Belle is the one-stop magazine for everyone interested in designing and interior decoration. It covers all facets of architecture and decoration. Buy a single copy or subscription to Belle magazine. It covers all facets of architecture and decoration. Designing of property is one of the passions of anyone involved with the interior decoration business. For more than thirty years, the magazine has developed and maintained a long standing relationship with the readers and has beautifully earned their loyalty, through effective content and important information. The main purpose and mission of Belle has been to create a magazine, blending in and celebrating the union of design, architecture, knowledge, and fashionable living. The magazine aims to reach out to the maximum number of people, and to influence their taste in the best home décor ideas. Seamless taste in interior decoration and expression of the most creative ideas of designing are what the magazine focuses on. Every month, this magazine brings to you new and innovative ideas, featuring some beautiful designs, and some pictures to take your breath away. Belle explores the creative mind in all the enthusiasts and fosters the passion of beautiful architecture and decoration. Belle features some of the most beautiful places for designing, tips to home decoration and suggestions for the young amateur designers and gives you a detailed update of the events that are taking place across the world. The magazine brings in the ideas of traditional designs and modern technology together to give you something that is out of the world.